Did you know the 365-day dime challenge can help you save more than $6,000 in a year? Saving money daily can be difficult, but it isn’t impossible. As we plan for a new year, money goals should be at the top of our list. While we should always be striving to improve our financial situation, New Year’s resolutions are a great way to enforce this action. If you’re looking for a way to start saving, a money challenge can help. 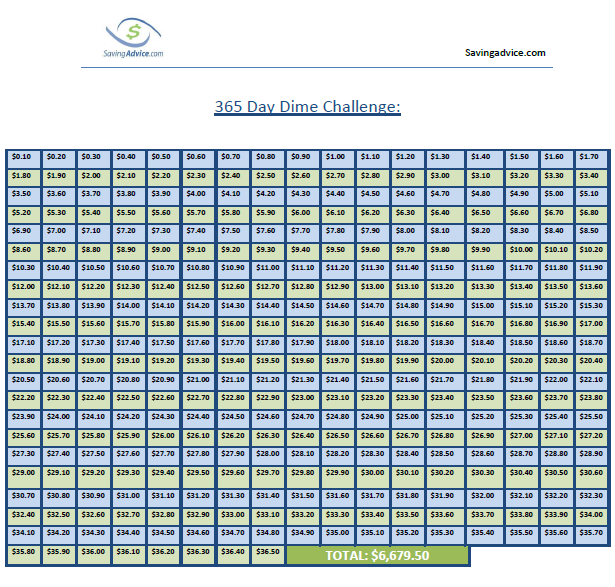 What is the 365 Day Dime Challenge? The 365-day dime challenge is a money challenge that prompts you to save money daily. Each day, you put aside .10 cents with the corresponding day of the challenge. For instance, on the first day, you save a dime, .20 cents on the second day, .30 cents on the third day, .40 cents on day four, and so on. Place a jar in a very visible area as a physical reminder to save every day. In just the first 90 days, you will accumulate $409.50. Considering that 46% of Americans surveyed by the Federal Reserve cannot cover a $400 emergency without borrowing money, this is important. Why the 365 Day Dime Challenge? The 365-day money challenge has a few variations, from the penny challenge to adding an extra quarter a day. 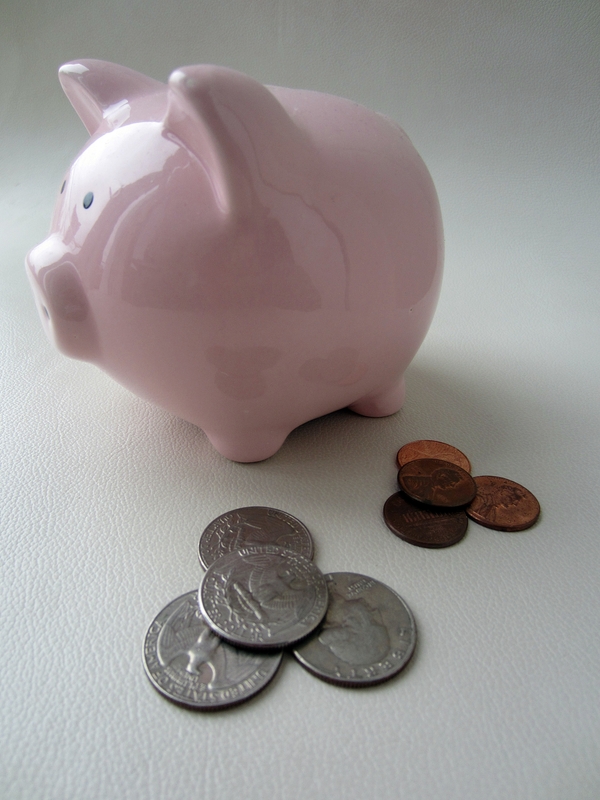 The penny challenge prompts you to save $668 in 365 days. The quarter challenge, on the other hand, adds up to $16,698.75 after a year. If the penny challenge does not match your goals enough, but the quarter challenge seems to be a little too hard to accomplish, the 365-day dime challenge may be just for you. As you can see, you’ll be able to save a total of $6,679.50. If you break this down daily, you’re only setting aside $18 per day over the course of the year. This seems much less intimidating than the $44 daily average from the 365-day quarter challenge, especially if your finances are not as strong as you would like. If you are up for the challenge, you can download the chart here. In order for such a challenge to work, you need to be diligent and consistent. The point is to save daily and create a habit that will benefit your finances for years to come. Plus, it’s a great way to build an emergency savings fund, which everyone should have. If you don’t think you will be able to dedicate an average of $18 per day in 2017, try adjusting to a level that is comfortable. For instance, you could start with 30 days at a time, starting the challenge over at the end of every 30 days. This would come out to $46.50 per month in savings, $1.55 per day, and roughly $558 total for the year. 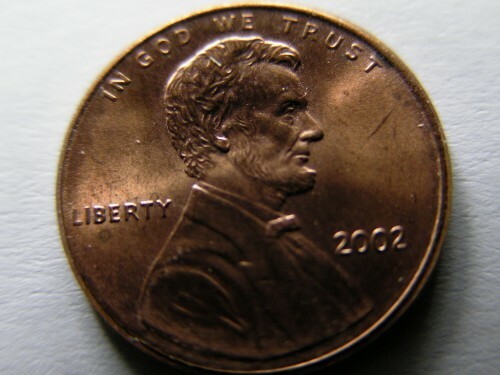 However, you might be better off doing the penny challenge where you will save a little more. Break down the numbers and see which challenge will work best for you. If a daily money challenge still seems unattainable, try the 52-week Money Challenge or the 12-week Money Challenge. Also, if money challenges are too much of a hassle, you can build your emergency fund with an app like Digit. This app analyzes your account, and slowly withdraws and saves small amounts at a time. It’s easy to download and install, and because it’s automated, you won’t even notice the money is gone until you check how much your savings has grown. Will you be trying a money challenge in the new year? Share your comments with us below. If you could save money every single day with little effort, would you? The 365 day quarter challenge could help you do just that. Here at Saving Advice, we love money challenges because they encourage you to pay yourself first and build an emergency fund. While you shouldn’t rely on a money challenge to build and maintain your cushion, it is a great and easy tool to help develop a positive habit. Challenges also keep saving money at the top of your mind. As we enter the new year, many people are looking for ways to stick to resolutions and improve their finances. These money challenges have become an increasingly popular way to do so. There are quite a few variations, but a money challenge we find interesting that will save you even more in the new year, is the 365 day quarter challenge. The 365 day money challenge comes in different forms. 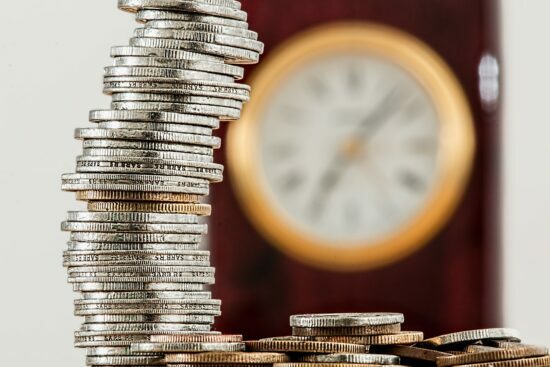 There is the penny challenge and the nickel challenge, and, if you’re looking to take your savings to the next level, this is a great way to do it. If you aren’t familiar with the 365 day money challenges, they’re pretty simple and straightforward. Usually, you’ll have a jar or container where you place money daily, as you do with the 365 day penny challenge. 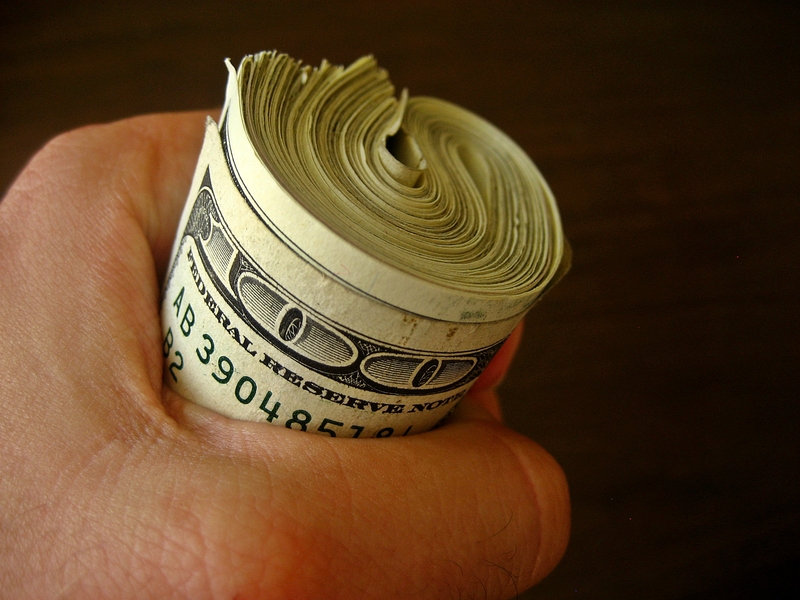 Physically putting money away every day helps with follow-through. However, for the first week of the quarter challenge, you’ll need to make sure you have cash on you. Each day, you’ll add another quarter to the jar. On the first day, you start with $0.25, on day two you’ll deposit $0.50, three quarters on day three, $1.00 on the fourth day, and so on. Within the first 30 days of this challenge, you’ll have $116.25 in your jar. It’s amazing how far a quarter will take you, isn’t it? How about trying this one for yourself? If matching the amount of quarters to the corresponding day you’re depositing seems overwhelming, you can adjust it to fit your needs. For example, start with 30 days at a time every month. This will still save you $1,395. But, as you can see, if you stick to increasing your deposits by a quarter each day, you will save more than $16,000 in the year. Download the chart here. Print it out and place it somewhere very visible (like your refrigerator) to help remind you of your goals. If you don’t think you can commit to a money saving challenge, you might want to try an app that will do it for you. For instance, you can easily download and set up Digit.co. Digit will then analyze your account balances and automatically make small withdrawals, which are deposited into your savings account. This way it’s out of your hands and you can build your savings without even noticing the money is gone. The real challenge here is not saving money but rather doing it regularly and maintaining a savings amount. Many people have no idea how much to save and may only put aside money sporadically as they see fit. It might be tempting to veer off your savings plan to spend on something impulsive, but your bank account will thank you in the long run. You will also thank yourself if you end up in a bind and need your emergency funds. And, the cost of feeling secure is truly priceless. What are your savings plans? Will you be trying the 365 day quarter challenge this year? Money challenge articles and savings challenges began to take over the Internet and social media sites, such as Pinterest, a few years ago. These challenges offered people an opportunity to get started saving or make saving a fun activity for the family to do together. Savings challenges and money challenges have helped tons of people to reach short-term savings goals. Some of the most popular challenges include the 365 Day Money Challenge, the 52-Week Money Challenge and the 12-Week Money Challenge. Each of these has variations to the rules because, as you know, saving isn’t the same for everyone. One popular variation on a money challenge is the reverse 52-Week Money Challenge. For many people the reverse money challenge is easier to pull off than the original. The 52-Week Money Challenge is a challenge that, in theory, starts the first week of the year. Many people begin this challenge as a part of their New Year’s resolution to save more money in the new year. The challenge starts out with the participant saving $1 in the first week, $2 the second week, $3 the third week and so on. At the end of the challenge you save $1,378. Like many savings plans and challenges people found issues. What worked for some did not work for everyone. The main complaint surrounding the 52-Week Money Challenge is that you are required (by the plan) to save more money around the holidays. Since this time of year is when most people are low on money because they are buying gifts and preparing larger meals many found it difficult to save more. That is when the Reverse Money Challenge was thought of. The Reverse Money Challenge is just like the 52-Week Money Challenge described above. The only difference is that in the first week of the challenge you save $52. You then go on to save $51 the second week, $50 the third week, $49 the fourth week and so on. The last week of the year you save $1 and you still save the grand total of $1,378. Many people like this approach for multiple reasons. As previously stated many people have a difficult time saving more money around the holidays. There are also quite a few people that feel more motivated at the beginning of a challenge than the end. As your enthusiasm about the challenge fades the amount of money that you will have to save will decrease. This will make it easier to stick to the savings plan in the long run for many people. If you are looking to adopt a savings plan or take on a money challenge, make sure to do your research. Many money challenges are year-long challenges. If your need for the money saved is more urgent you may want to try something like the 12-Week Money Challenge, which helps you save $1,000 in 12 weeks. There are also money challenges for couples, kids and college students as well. You can find a savings plan or money challenge to suit your savings needs. Smartphone applications are made to make your life easier. In recent years more and more personal finance apps have begun to surface. One great savings app is digit.co. Digit takes a look at your savings and then makes withdrawals to place in your savings account automatically. The app is easy to install and activate and from there Digit does the rest. Check it out at digit.co. This challenge will give you a better idea of where your money is going. Take 30 days and track every penny you spend and what you spend it on. At the end of the month, draw up a budget and pick places where you think you spend too much money and make some cuts. This is a great idea to not only save money but also get better control of your finances. The longer you keep this tracking challenge up, the more conscious you’ll become of how you are spending your money and it will affect your long-term financial health. The 52 week savings challenge is a great way to save if you’ve made saving money your New Year’s resolution. You start the savings plan out with saving $1 the first week, $2 the second, $3 the third and so on. Many people use this base model of a savings challenge and alter it to their specific needs. Some people start with saving $52 and regress back to $1 the final week of the year (this makes it so that you don’t have to save as much around the holidays). At the end of the year you will have saved $1,378.00. 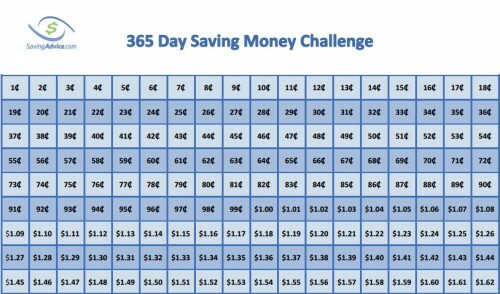 The 365 Day Money Challenge is similar to the 52 Week Money Challenge. The major difference is that you are saving pennies at a time, not dollars and the amount increases daily instead of weekly. On day one of the challenge, you save $0.01 (usually people use a jar for this challenge). The second day you would save $0.02, the third $0.03 and so on. At the end of the 365 days you will have save $667.95. This savings challenge approach is a bit more aggressive than the two previously listed. The 12-week savings challenge starts with you saving $60 in the first week and increasing each week by $5 (Week 2: $65, Week 3: $70, Week 4: $75 and so on). At the end of the 12 weeks you will have saved $1,000. This is recommended if you are looking to save $1,000 within a specific period of time. Some people also just repeat this savings challenge over and over again, saving $1,000 at a time. The 52-Week Money Challenge can be difficult for those who don’t get paid weekly. Because of this, the bi-weekly money challenge was created. You still save the grand total of $1,378, however, you don’t have to put money aside weekly. Instead you start out by saving $3 the first week and increasing by $4 each week after that (Week 2: $7, Week 3: $11, Week 4: $15 and so on). If you are looking to save more than $1,378, you may want to try the Mega 52-Week Money Challenge. The mega challenge starts out by saving $5 and increasing by $5 each week (Week 2: $10, Week 3: $15, Week 4: $20 and so on). By the end of the year you will have saved $6,890. If this is something you are able to pull off, it is a great way to save a fair amount of money throughout the year. Like the mega money challenge allows people to save more money, the mini money challenge allows people to save a little less over the span of the year. It is still over the span of 52 weeks, however, you start with a smaller amount ($0.50). Week one you save $0.50, week two $1, week three $1.50 and so on. At the end of the year you will have saved $674. The “no spend” challenge is much like the tracking challenge. You return to the basics. The “no spend” challenge forces people to only pay for the necessities (rent, utilities, bills, gas, food, etc.). For the “no spend” challenge you would cease to spend money on things like going out to eat, shopping (clothing, etc) and going to events or places like the movies. If you have to spend money on it and it is not a necessity, you simply don’t do it. This challenge can save you a ton of money if you are able to pull it off over a long span of time. Many people think the spare change challenge is only useful if you spend cash daily. You spend cash but don’t touch the change and at the end of the day you place the change in a jar or piggy bank. However, many banks allow their members to set up “spare change” savings account. For instance, Wells Fargo has a round up option. You spend $3.55 on milk at the grocer, $.045 goes into savings (it rounds up to the next dollar). You will be surprised to see how quickly these savings stack up! Make the challenge more interesting and vow to not touch your spare change savings for an entire year and see how much money you can save. The easiest challenge of them all is one you don’t have to think about doing. Like the spare change accounts, you can also set up monthly, weekly and even daily withdraws from checking into savings. Or, you can use a savings app like digit.co, which takes small amounts and puts it away for you. The saving advice forums is a great spot for discussing savings challenges, money management and more. Sign up here to continue the conversation. When it comes to year-long money challenges, most people think about them at the beginning of the year. This is usually as part of their New Year’s resolutions. Because of this, many people have the impression that in order to correctly do them, you need to start the challenge at the beginning of the year. The truth is that you can begin the 365 day penny challenge any day you want during the year. Yes, beginning on January first wraps it neatly into a single year time period, but there is nothing that says you have to start then. The fact is that the challenge has been specifically created so that you can start at any point during the year. You simply have to pick a day to begin and you’ll be done 365 days later. Not having to wait until the “perfect time” is one of the best aspects of this challenge. There really isn’t an excuse not to begin it the day that you come across it. If you decide to delete the lowest amount each day, you’ll be out less than $5 for the first month, but you’ll have saved money on a daily basis for 30 straight days. Even in the worst case scenario, the vast majority of people should be able to pull this off even without any preparation ahead of time. The penny challenge is one of the easier challenges to understand. Each year has 365 days, and on each of these days you need to pay yourself first. It can be as little as a penny, and as much as $3.65. 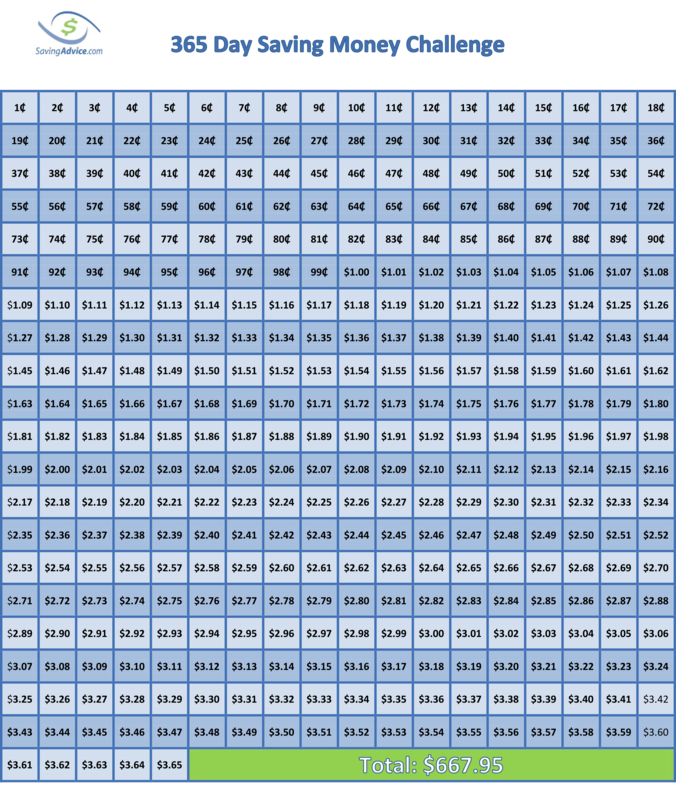 Once you have paid the amount, you cross it off the challenge sheet, and the next day pay one of the remaining amounts still available on the chart. At the end of 365 days, you will have saved just under $668. Another important part of this challenge is that you should physically place the amount you’re saving each day into a jar (or other container). So you don’t accidentally forget, the jar should be in a place you’ll see each day. You can then place the accumulated money into a dedicated bank account every week or so. This way you have your savings all in a single place where you know it’ll be each day, and it will help ensure that you make the savings payments daily. The big advantage of this challenge over the 52 week savings challenge is that it requires you to make a payment to your savings each and everyday. The goal is not only to get you to save the $668, but also to instill the habit of saving money, even small amounts, so that it becomes a part of your daily routine. Once the habit is formed, you should be able to continue it with even bigger challenges in the future. Savings apps like digit.co are great alternatives or supplements to money challenges. Basically, the app analyzes your account, and puts small amounts into savings for you. Automating your savings account can make it a lot easier to build that emergency fund or vacation fund you’ve been planning to start. You can sign up for digit.co here. So what are you waiting for? The day to begin is today, and there really is no excuse not to. If you started another challenge this year but have already stopped for some reason, it’s time to begin again. If you know someone who procrastinates, tell them to try this challenge. You have nothing to lose except the fear of not having an emergency savings account. And for those of you who are saying to yourself that you like the idea, but don’t know where you would begin to find the savings, you can’t even give that as an excuse. Here are thirty-one savings tips that will ensure that you’re able to make it through the first month of the penny challenge.